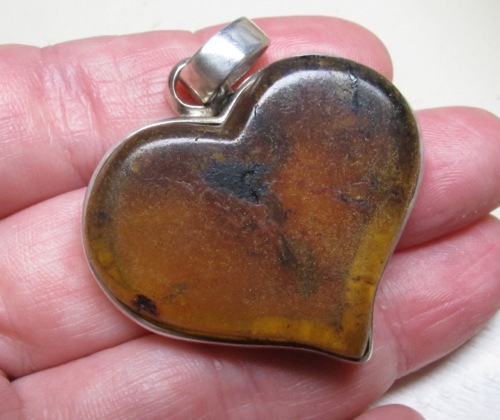 This large amber pendent is what I call a “well loved” pendent and is worn most days. As you can see in this image it has become crackled on the surface and rather opaque. It is time to give it a rejuvenation treatment ! To start off I need to grind it down to get rid of the damaged layer. As it is a large piece and still in its setting the best way is to do it by hand. The bail (the bit where the chain goes through) needs to be secured so it doesn’t risk getting marked on the cutting wheel. Here you can see the damaged layer has been taken off and it is starting to look much better already ! Next step is polishing by hand. Looks a bit different doesn’t it? The only down side of re-polishing something while still in the setting is that I cannot go too close to the setting edge as it could mark or damage it. As you can see in this image the amber is still opaque and crackled but from the top it doesn’t show so still worth it !